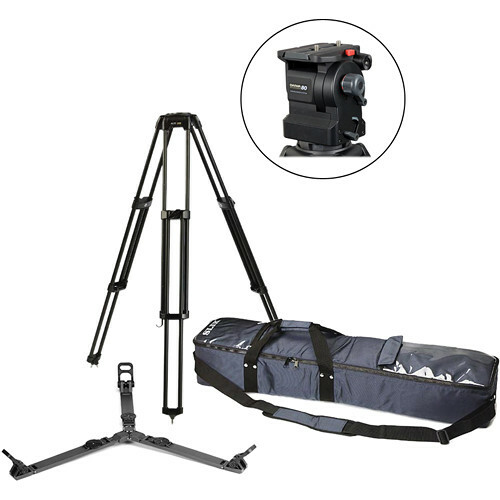 The Daiwa-80 F1 Tripod System is an all-in-one stabilization kit that provides a sturdy, flexible foundation for ENG and EFP applications. Including fluid head, tripod, expandable spreader and soft carrying case, it's the solid base on which any production should be built. The Daiwa-80 fluid head, with its load capacity of up to 48.5 lbs, is ideal for large digital camera configurations used in professional broadcast, educational and corporate productions. This head is perfectly counterbalanced through a tilt range of +60/-75 degrees, for cameras ranging between 26 to 48.5 lbs (12-22kg). The 209 Tripod's two sections make for quick and easy set-up and fold-down. Constructed of all-aluminum rail, these sturdy legs extend to 61" (155cm) and feature a leg locking design that won't permit slippage or over compression (leg damage). The leg pivots are self-adjusting and come with a 100mm claw ball base and eye hook for cable or accessories. Used on level surfaces, the FL9 Floor Spreader stabilizes the tripod's legs while keeping them at an equal or preset distance apart. The spreader's expandable arms allow the tripod legs to extend without detaching the spreader. Rubber footpads provide added stability. The 1080-9 Soft Carrying Case is a soft-sided bag with reinforced sides made from heavy duty Nylon. It is designed to fit the 209 tripod with fluid head. Utilizes space age die-cast alloys, composites, titanium and bronze materials, to bring about lightweight design and construction, for outstanding quality, reliability and performance. Features a rotating knob that allows adjusting the counterbalance to compensate for the camera's weight. Provides excellent performance through a tilt range of +60/-75°. The sliding quick release plate with safety lock provides +/-2.5" of adjustment, for perfect horizontal counterbalance. The Daiwa-80 offers a variable and repeatable viscosity fluid drag system, ensuring perfect pictures during pan and tilt movements, eliminating jerks and vibrations. Line markings on the adjustment knobs make actions repeatable to the millimeter. Box Dimensions (LxWxH) 39.0 x 22.5 x 16.0"